January is proving to be an exciting month for Maltese football fans as two Italian clubs, namely Serie A side Fiorentina and Monza, who are currently in Serie C, travelled to our islands in the last few days for short training camps before resuming their domestic commitments in the coming weeks. Malta has long been committed to try and establish itself as an ideal destination for football teams to spend their winter break here. Last week, Fiorentina coach Stefano Pioli heaped praise on the training facilities used by the Serie A side during their five-day stay in Malta and Brocchi was equally complimentary on what he found on our island. 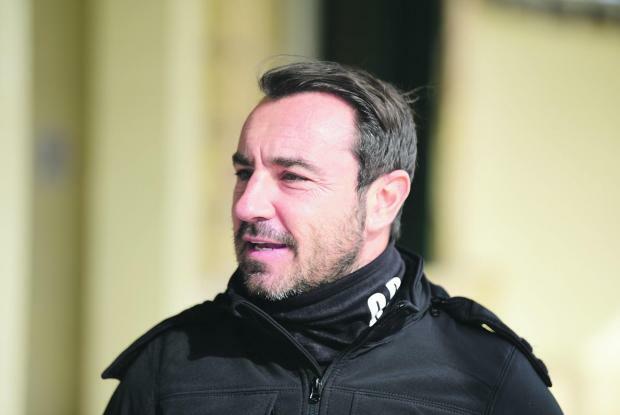 “The facilities are very good and the competent structures that we found here are helping us to prepare well for the second part of the season,” Brocchi told The Sunday Times of Malta. This is Brocchi’s second visit to our islands after he was part of the Milan contingent that was here in January 2007, when led by Carlo Ancelotti, the Rossoneri faced Birkirkara at the National Stadium. “Indeed, it is my second visit here and it is always a pleasure to visit places which are so beautiful,” he said. Monza arrived on our shores last Monday and wrapped up their training camp yesterday with a friendly match against Ħamrun Spartans, coached by Giovanni Tedesco, giving an Italian flavour to this exhibition game . Tedesco and Brocchi clashed multiple times on Serie A fields including in a famous Palermo win at the San Siro in October 2006. Asked about meeting the Spartans’ coach yesterday, Brocchi was pleased to reunite with him again. “I remember playing against him, of course – those were the good old days,” Brocchi explained. Brocchi entered the fray at Monza in October after former Milan president Silvio Berlusconi and his right-hand man at the club of Via Turati, Adriano Galliani, took over at the Lombardy-based club. After 20 games, Monza are currently 12th in the 20-team league on 26 points and are just one point behind the last promotion play-off spot occupied by Sudtirol. During this transfer window, the club has already spent over €1.5 million in players as the Berlusconi-Galliani partnership has huge ambitions for this club. However, Brocchi has played down any type of pressure, which such investment can mount over his shoulders. “We are bringing in some good signings and they will help us to increase our technical level and competitiveness,” the former Milan coach said. “The Serie C is a difficult championship but I think it is very useful for players who want to play at the highest level because these games can help you learn how to handle the pressure. As a player, Brocchi played during one of Milan’s best periods while Silvo Berlusconi and Adriano Galliani were running the club. With the Rossoneri, Brocchi won the UEFA Champions League twice, the Serie A, the Coppa Italia, the Italian Super Cup, the FIFA Club World Cup and the UEFA Supercup in the space of five seasons. Berlusconi and Galliani have now entrusted him with Monza’s ambition of reaching the Serie B. “It is a project that will start to take off now, in January, because the new ownership took over in September and therefore this is our first proper time to start reshuffling the team the way we want,” he said.